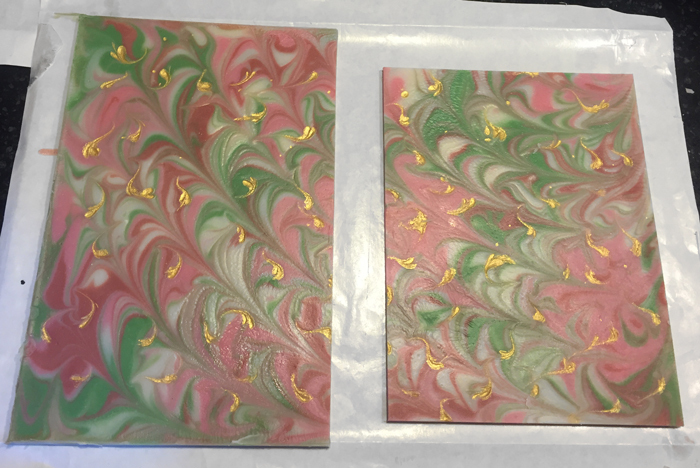 It has taken me quite some time to figure out and be able to recreate a rimmed soap design - both in cold process and a combination of melt and pour and cold process. Now that I feel confident in being able to recreate this in a variety of designs with consistent results, I will share how I put this together. For cold process soap, it takes two days to complete. Day 1 to create the rim and allow it to set to be firm enough yet still flexible to manipulate. Day 2 to create the inner core soap. Depending on your formulation, you may be able to do this in a shorter amount of time, but I find the 2 day process works for me. Melt and pour/cold process can be done in 1 day as it takes only an hour or so for the melt and pour rim to set up. This is an advanced technique so it is assumed that you have formulations that you are comfortable with based on the design you may want to use (slow moving for example.) 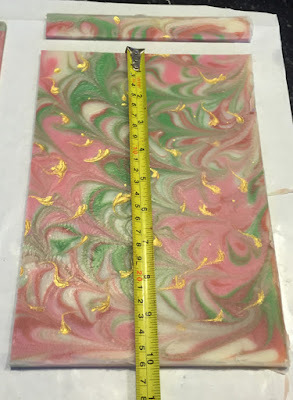 It is also assumed that one knows how to calculate amount of soap needed for the end result and the size of your molds which will be unique to each individual. Since these are soaps that I do sell, I do not provide the formula I used. If you want to do a complex design, use a slow moving formula. - I do not add fragrance to the outer rim - I keep it as simple as possible to avoid issues that fragrances can bring to the soap. You are working with a thin layer so control is important. - The rim soap needs to gel completely. If not, it will crack when you try to manipulate it. - I use a variety of formulations but they mostly are 45% hard oils/butters and 55% soft oils. - I have removed the slab and cut and rolled anywhere from 12 - 24 hours after pouring. The soap is not warm but room temperature. No heat is used to roll and place the rim into the PVC. - Rim thickness. I find that 4 - 5mm is a good thickness - not too thin that it will crack, not to thick that the outside will stretch too much as you roll it (and create small stretch cracks). This is personal choice, your results and issues may vary. 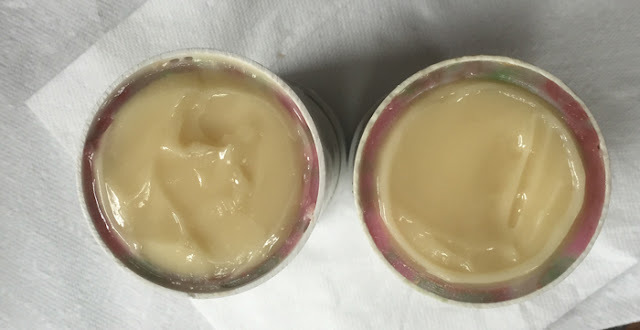 - I use the same or almost the same formulation for the rim and the inner core soap. - I soap these at approximately 110 degrees F.
- I use 3" PVC pipe cut to 6 1/2" to 7" lengths. This size works for me because I have short fingers and need to be able to reach into the pipe to manipulate the rim to align the seams for a tight fit. - Measurements are important if you do not want to waste soap (and who wants to waste good soap.) Decide on the height of your mold first, then determine the size slab you need to make and find or make a mold to accommodate your size so that you do not have to do too much trimming to fit the mold. 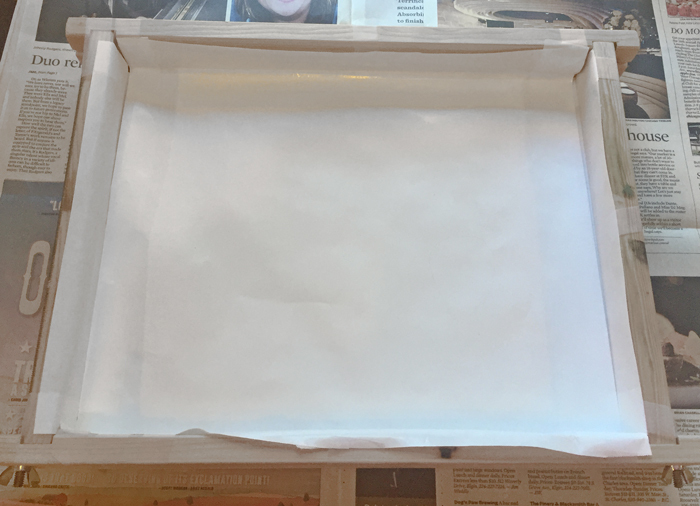 I use a wooden breakaway slab mold that is just over 14" by 10" lined with freezer paper. For this size mold to get 4 to 5mm thick slab I use 15 ounces oils and allows me to fit 2 PVC molds. 2. 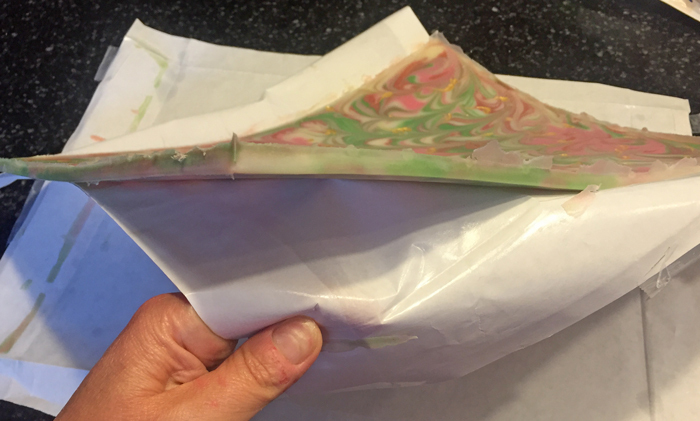 Pour this soap into the mold in the manner you prefer to create your outer rim design. 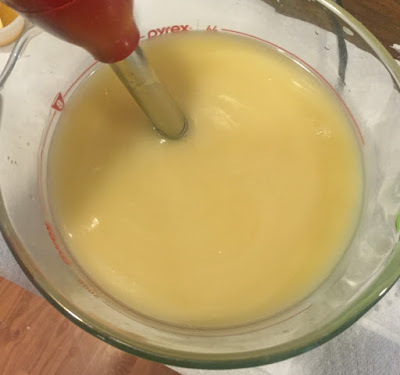 You may have to lift the mold and maneuver it by tipping it slightly in various directions so that the thin layer of soap spreads evenly to all areas of the mold. 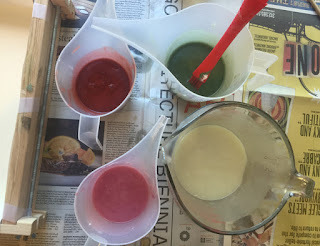 After manipulating the soap with a thin dowel rod to create the waves of color. 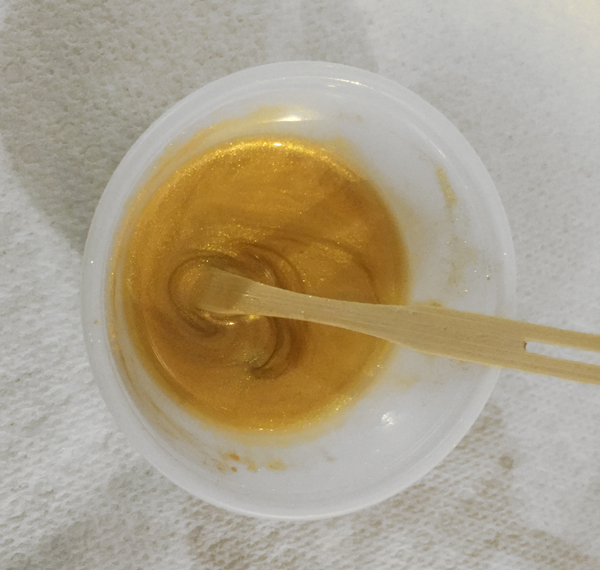 The gold mica was added after the swirls were completed. 3. Allow this soap to gel. To insure a full gel on this layer I use the oven set to 170 degrees F. If doing this, make sure your mold is oven safe. Set the oven to 170, then once you place the soap (I cover the mold too) into the oven, turn it off and let it sit for a day to gel and then cool slowly. If your soap is not gelling by turning off the oven, keep it on for 5 - 10 minutes or so. Do not cook the soap as it will wrinkle on the surface. The time and temp can vary and you will need to figure out what works best for you based on the size of your slab, the thickness and your oven. 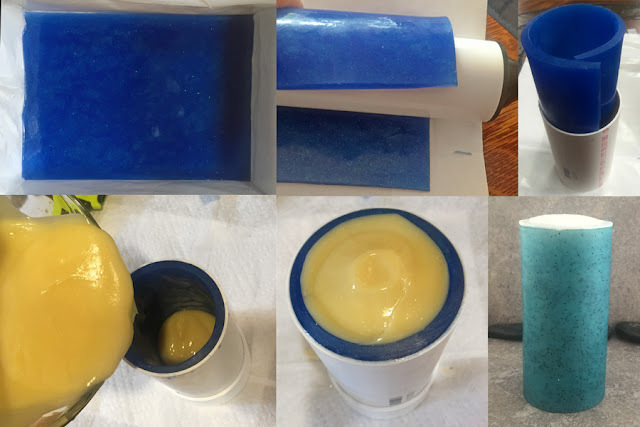 You can also try to use a heating pad under your mold to force gel. 5. Trim the slab to fit your PVC pipe mold. These measurements will be based on the height, inner diameter of the mold and the thickness of your slab. I trim mine to 6.5" or 7" x 9 3/8". Too short and the seam will not meet, too large and it will overlap too much. The thicker the slab, the shorter the width you will need. You want the ends to overlap slightly so that when you press the soap into the molds to align the seam, it is a tight fit. My slab size allows me to form two rims that fit my PVC molds. 6. 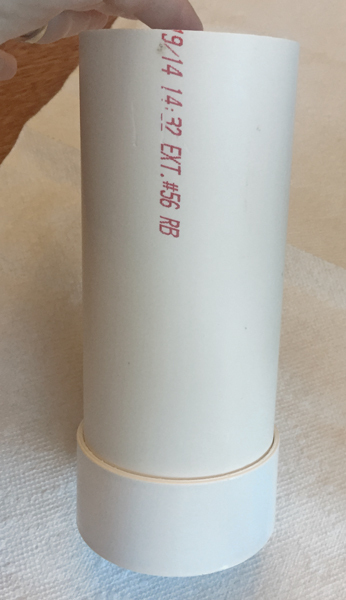 This is the PVC pipe I use with the flat bottom end cap. It creates a pretty good seal so that the soap does not leak out the bottom. 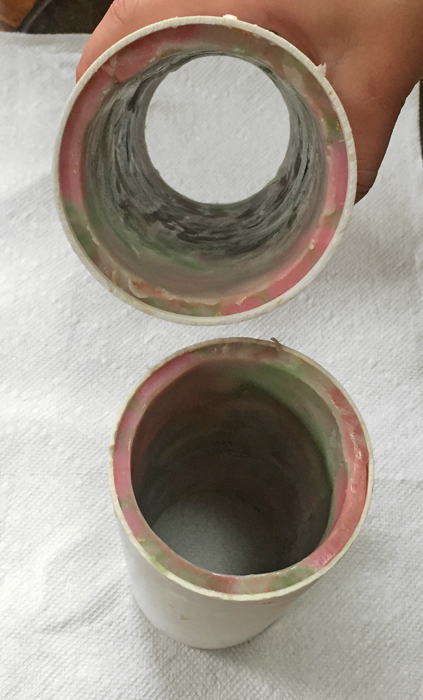 Thin walled charlotte drain pipe purchased at Lowes Home Improvement in the United States. End caps too. This pipe comes in 10' sections that are cut to size. 7. Now that your slab is trimmed to fit your mold, place it design side face down and roll it so that you can then insert it into the PVC mold. I use a rolling pin but you can also use the curvature of your PVC pipe. This makes it easier to form without breaking it. 8. Carefully slide the rim into your mold with the seems overlapped. This is where you will then need to manipulate the rim for a tight fit and press the edges so that you end up with a tight fitting seem. This takes two hands so I cannot get a picture of the inside manipulation. If you cannot align the edges due to too large an overlap, you may have to remove it and trim a bit more off the edge - be careful as trimming too much will leave a gap in your rim. I do not line the molds as the rim as already formed and will not stick to the sides of the pipe. Adding a liner, will also create an indent in the soap that will look like another seam. Slab rolled and placed into the mold and pressed from the inside to the sides to align the edges and create a tight seam. 9. Cap the end of the PVC pipe molds and create your inner core soap. 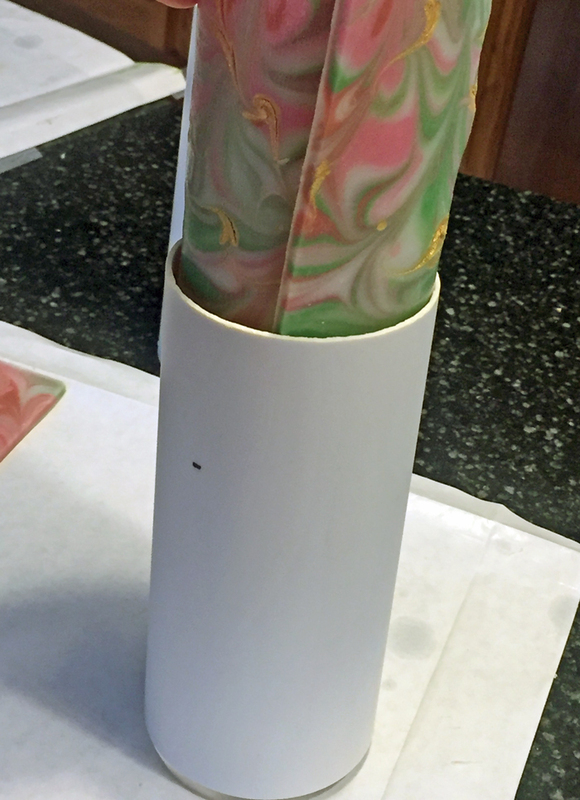 For two 6.5" to 7" tall molds and a 4 - 5mm thick rim, I use 34 ounces oils for the inner soap. You can color this soap and fragrance however you like. I find a solid core and a designed rim coordinate nicely and allow the rim design to pop. 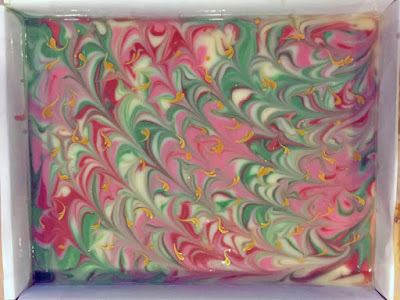 You could also do the reverse and create a solid color rim and an "In the Pot Swirl" for the inner soap. Lots of possibilities. 10. Pour at light to medium trace into your molds. 11. Cover with plastic wrap and wrap in towels to allow the soap to gel (I always gel my soap, not sure how these come out not gelled.) Be careful lifting your molds - if your end cap is at all loose, it can slip off and your soap will spill out. Lift from the bottom to transport. 12. Allow to set 24 - 48 hours. The longer you keep it in the mold the easier it is to get out. 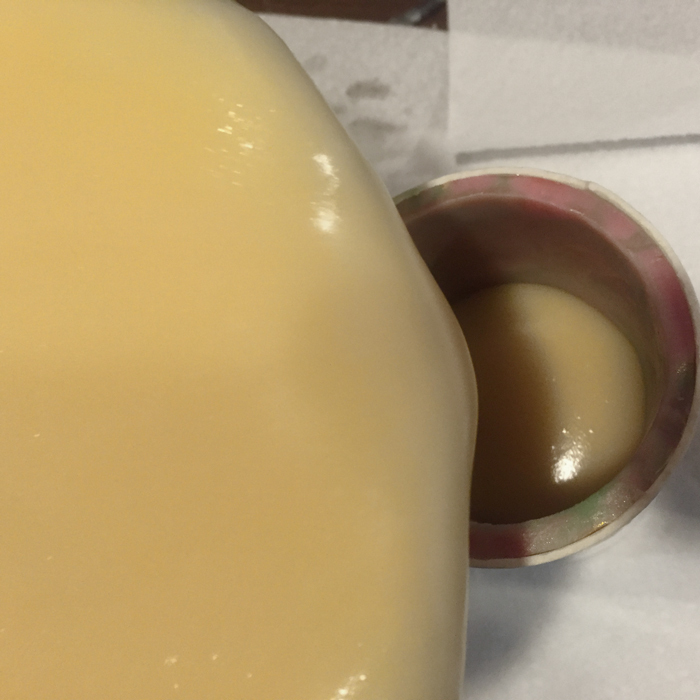 It can be tricky to unmold soap in a PVC pipe though. I tend to place it in the freezer for an hour or so as it helps remove the soap from the pipe. 13. Cut your soap to your preferred size. Using melt and pour for the rim. The process is the same but you do not need to wait for the soap to gel, just to set up. I used clear SFIC base. Once set, the thin layer is quite pliable and easy to form into the mold. Below are two soaps using melt and pour as the rim and cold process for the inner soap. Because cold process can and will shrink as the water evaporates out, I did a large water discount (1:1.5 lye to water ratio) to create the cold process to reduce shrinking. Not sure how these will hold up after a full 6 week or longer cure but we shall see. Collection of finished rimmed soaps. The melt and pour are on the bottom right. Amazing tutorial. Thank you for sharing. Wonderful totorial. Thank you for sharing! Thank you so much for taking the time to type out the directions, attach pictures and for shaing this beautiful technique! Very kind of you. Appreciate you sharing this wonderful idea. Thank you so much for the blog tutorial. these are such beautiful soaps. I hope to be able to attempt these soon. Thank you for sharing your expertise with us. Beautiful soap, thanks for sharing. Wow, beautiful soaps. Thank you for sharing this. These are so beautiful. Thank you for sharing the technique! Awesome, so nice of you to share, thank you. Your soaps are very pretty. I've admired rim soaps made by Tatsiana, Creative Soap by Steso and Jelena of Soap Techniques. Nice to now how to do the technique, and hope to try one day. Does the soap break easily, when you put rim into PVC looks like soap seam overlaps, does it move together easily? Yes - they make absolutely beautiful soap! I find that if you insure a full gel on your rim, you should have no difficulty working with it to form it into the PVC mold. WOW!! this is amazing!! What a great talent! Thank you so much for sharing, awesome tutorial! Hi Alayina! Thank you for this beautiful tutorial. I am the all CP person (although have nothing against M&P), so I attempted yesterday to do it from CP soap (basically creating the M&P part from CP soap). Now it is in the mold, waiting to be unmolded. I am not sure if the inner filling will stick to the outer part, though, since I waited 24 hours between preparing the outer part and pouring the filling in. I know that this can cause problems soap separating but I hope that if it gels, it might be fine. Anyhow, it is my first attempt, so I guess I can do better next time if it does not stick. Did you ever try whole CP? Any suggestions? Soap well and thanks again! Hi there - yes, most of the rimmed soaps I make are 100% cold processed as indicated above. I attempted 2 with a melt and pour rim and a good size water discount for the inner cold process to see how they would turn out as the cold process cures. Ah, sorry, I didn't see that, I don't know how I read, it must have been too late in the evening :D So you have no problems with separation then? I love it! I have no problems with the cold process pieces separating. We shall see what happens the the melt and pour/cold process combination after a full cure. I took precautions to minimize shrinkage of the cold process by using a decent water discount and adding sodium lactate to it. I Thank You for sharing your creation with us , and i wholeheartedly commend your innovation for circular soap ,sheer ingenuity . 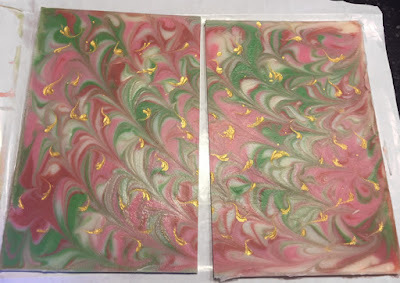 It would be so nice for me personally if you would name the process that credit would find its proper home , if not then i would address it as "Alaiyna Rimmed Soap Design". Again, much thanks to you for sharing this lovely innovation. Thank you for your kind words but this type of soap design was inspired by other versions of it that I had seen in the past. I can take credit for the various exterior designs and color combinations - but again, so much is shared and repeated in the soaping world that I doubt anything that I have created has not been done by someone else somewhere whether I am aware or not. This is a combination of a variety of already known soaping and decorating techniques. Wow! I'm impressed! Thank you for sharing this! Now I'm excited to try this. Thank you for sharing! Beautiful soaps! Can't wait to try this. Could you explain to me what kind of tool you use to cut the outside rim of the soap so think? I use a 12" long drywall taping knife to make the long cuts so that they are straight. 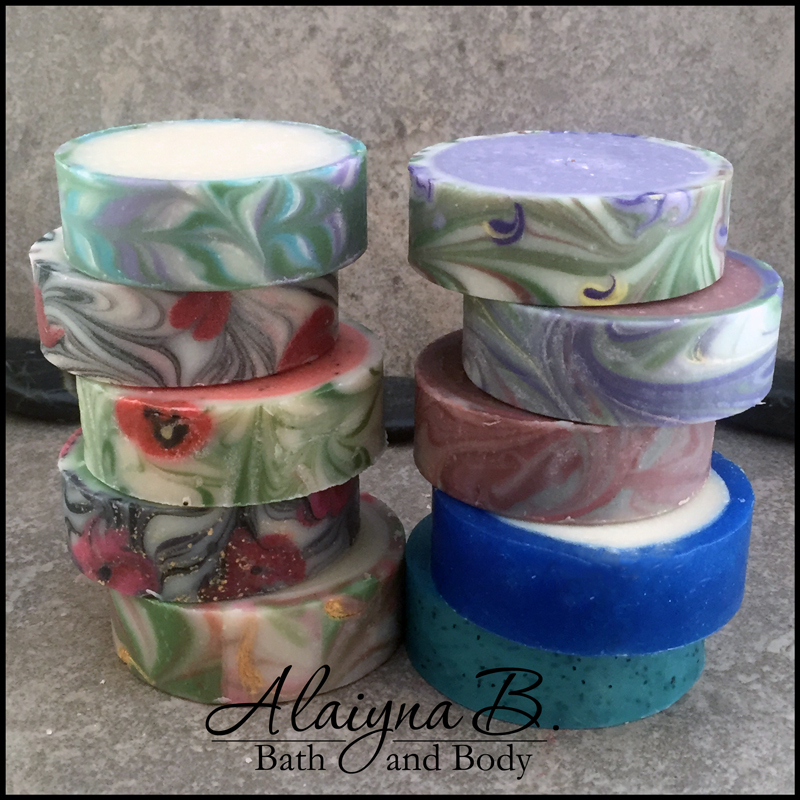 Alaiyna I am blown away by your beautiful soaps! What works of art you have created and so gracious of you to share this! Now you did it! Now I have to try this technique! I love it. It is beautiful! Lovely! Very kind of you to share it with us - thank you. Absolutely beautiful !!! Definietly going to try. Thank You so much for sharing, how original !!! 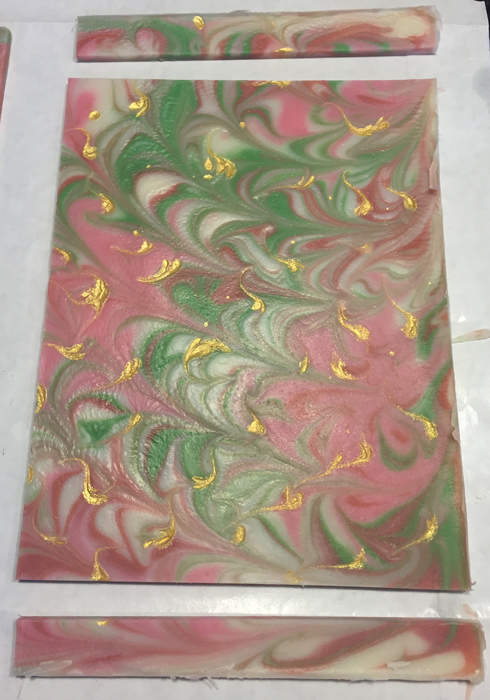 Thank you - it is addicting and results in some very unique soap designs. Can't wait to see what yours looks like. I have more ideas in my head than time to create them. 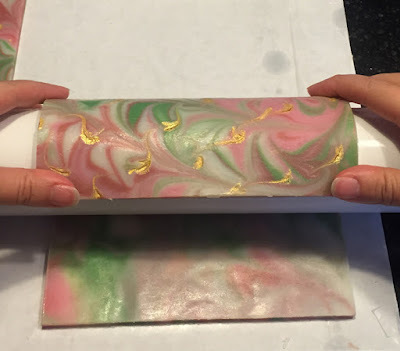 Beautiful soap, I would love to try this. Think I need to get some pipe. Thank you Thank you!! I just cut my first attempt and it looks great! Your soaps are beautiful and inspiring. I poured a thin slab yesterday but it cracked as I rolled it. Do you think that is because of the choice of oils that I used? I am going to try again and go palm free, do you think that will help? The soap is not lost though; I will take your other idea and line the sides of a loaf mold with the the "failed" batch. That in itself is beautiful. Thank you for sharing. Hi Barbara - make sure you gel the slab, otherwise it will most likely crack on use. I use 10% palm oil in mine. Thanks, going to try it again. I did gel the slap but I had about 20% palm so trying something different this time. I might have been a little too thick too. Wow! 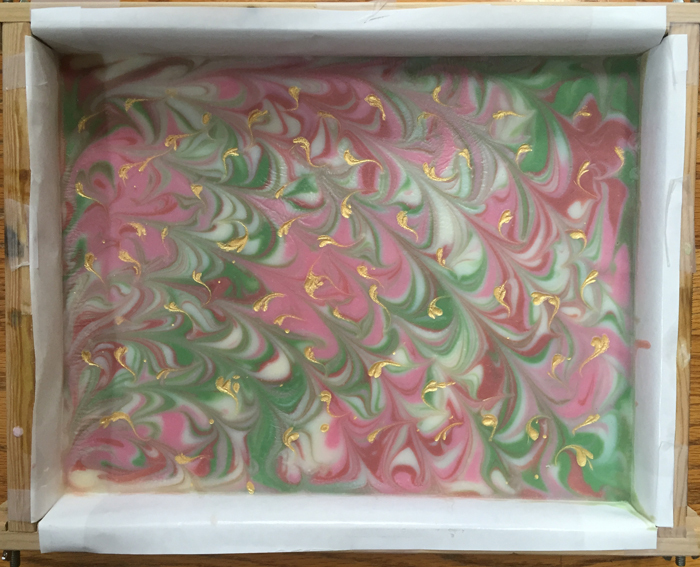 Lovely soaps :) Thanks for sharing! Just found your post and am intrigued. I was wondering if the M&P soap with CP inside ended up separating? Nope - these soaps did not separate at all. I did use a decent water discount on the cold process to prevent shrinkage. Amazing!! very well explained, thank you! Hi, I will be attempting this for the first time for a soap challenge and was wondering if you use a water discount? My tutorial suggests a 30% discount. Possibly - I have not tried it. thanks! want to try this, when you say you used Oz's of oils, is this the TOTAL of the batch, or literally just that much of oils? The ounces of oils is the oil only. The entire batch will be more once you add water and lye. These are beautiful. Have you done a tutorial on how to do the square rimmed soaps? I am fascinated by this... good job and thank you for sharing you knowledge! Thank you very much for a wonderful tutorial. This is the next technique I am going to be trying. Hi there, just wondering how the melt and pour rim turned out after the 6 week cure? Did it shrink? 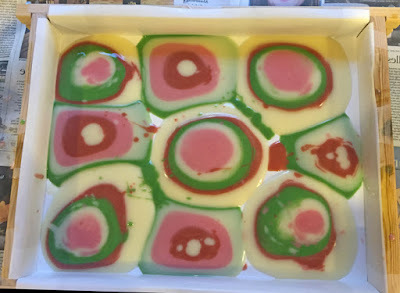 The rimmed soaps with the melt and pour rims are perfectly fine. I made sure to use a decent water discount for the cold process inner portion so as to minimize shrinking as i was afraid if that part shrunk too much, it might pull away from the melt and pour rim. So far so good. I am new to soap making, but most of all thank you for sharing this wonderful technique. Absolutely lovely! Than you for sharing.